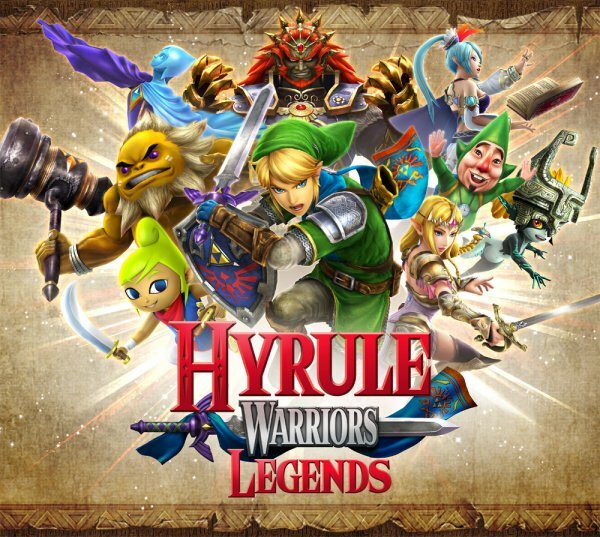 The original Hyrule Warriors was a solid if slightly forgettable attempt at fusing the worlds Zelda and Koei Tecmo's Musou series, and despite its occasionally repetitive gameplay managed to alleviate fears that it would be little more than a shameless cash-in. Now, with the 3DS badly in need of top-drawer software as it shuffles into its final years, this monstrous mash-up is being dusted off for a second outing - albeit one with noticeably weaker presentation and a smattering of new content. 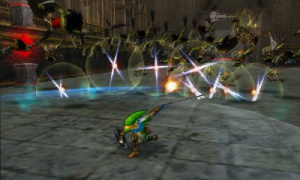 As before, Hyrule Warriors Legends seeks to combine Zelda's story and characters with the more action-oriented gameplay of the million-selling Musou franchise - a franchise which is certainly no stranger to such cross-pollination and has been expanded in recent years in include such properties as Mobile Suit Gundam, Dragon Quest, Fist of the North Star and Heroic Legend of Arslan. While the characters and settings in each of these outings could not be more different, the core mechanics remain largely the same - you're fighting to control a large battlefield by taking out enemy commanders and successfully occupying various strongholds around the map. 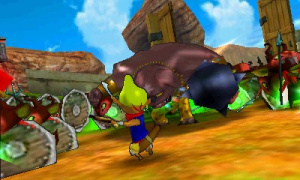 At certain points massive monsters will appear which require you to use sub-weapons - such as a bomb, hookshot or boomerang - to render them vulnerable to your blows. Mission objectives are dished out to keep things fresh, but the game rarely moves away from these basic elements. Mixing up normal and strong attacks reveals an almost dizzying selection of different combinations, and this variety is spread across all of the selectable characters, meaning that they all play very different from one another. Each also has a special "Musou" attack which can only be used when your special attack gauge is full, as well as a magical focus state which can be triggered to speed up attacks and unleash an additional, area-of-effect special. It's also possible to dodge blows and outflank your enemy, and - should they be commander or boss rank - you'll usually open up the opportunity to unleash a devastating counter-attack special. All of this might sound overwhelming at first, but thankfully the excellent Wii U control scheme has translated almost perfectly to the 3DS. The only sticking point is the lack of a second analog stick on the standard 3DS console - on the New Nintendo 3DS, the analog nub naturally assumes this role. However, we found we rarely used it to manipulate the viewpoint anyway, instead favouring the use of the "L" trigger to snap the camera back behind our character. While the button-mashing melee action might suggest a mindless brawler, Hyrule Warriors Legends - like its Musou brethren - possesses a tactical side. Keeps and outposts which are under your command spawn allied troops, and clever planning can help turn the tide of combat, flooding the map with friendly soldiers. However, such strategic shenanigans are curtailed somewhat by the fact that the narrative of each battle is set in stone, and certain events occur regardless of how much you're dominating proceedings. Still, the illusion of a contest where your single soldier can make a difference is an effective one, and the Musou series owes much of its commercial fame to this alluring mystique. Sprinting the length of the battlefield to aid a comrade in trouble never really loses its appeal - everyone likes being a hero, after all. Hyrule Warriors Legends is one of those games that makes you feel almost unstoppable. Each mission will see you take down hundreds if not thousands of enemies, and while the lowly foot soldiers put up little resistance and gladly stand around waiting for your weapon to hit them repeatedly, it doesn't take away from the awesome spectacle. 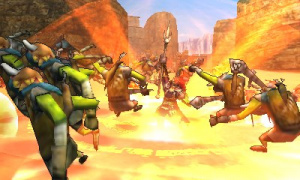 Even on the 3DS - where the visuals have taken a noticeable hit from the Wii U original - there's still a thrill to be had from hacking your way through legions of foes with reckless abandon. This does become slightly repetitive over time, but the fact that each of the game's playable characters has a totally different move set (and, in some cases, has access to other weapons which totally change the way they handle) means that each feels subtly different. It's also worth pointing out that each character gains additional combination moves as they level up and you use material to unlock "badges" - buffs and boosts which augment each fighter's prowess in battle. This element of the game can become irksome - especially when you're cycling through the entire roster making sure that each upgrade is unlocked - but it does give a sense of growth to each fighter; it feels like they are becoming more adept as you master the game's complexities. One of the most welcome new features introduced in the 3DS version has to be the ability to switch between character at will during a battle. On the Wii U version, it was sometimes impossible to get to a certain point on the map in time to save a stronghold from falling or rescue another character, but now you can hop between friendly commanders simply by tapping their portrait on the 3DS touch screen. It's even possible to tell the other characters where to go on the map, should you wish to get truly tactical. This element of control could be seen as a trade-off for the fact that there is no co-operative mode in this handheld offering, but it changes things drastically - and makes the game a more appealing experience. Hopping between soldiers is the easiest way to totally control the flow of war, and this also prevents some of the longer missions from growing too stale and samey. For those missions where you don't have any controllable allies on the field, there's also a new item in the form of the Ocarina which allows you to fast-travel between various points on the map. Hyrule Warriors Legends contains the same dimension-hopping storyline seen in the Wii U original, complete with identical cutscenes - this time presented in even lower-quality FMV. However, interspersed throughout are a handful of missions starring the much-hyped "female Link", otherwise known as Linkle. She benefits from a couple of all-new FMV cutscenes and her missions are enjoyable thanks largely to the fact that, as a character, she controls very well indeed. Her crossbow weapons allow her to attack from a slight distance, and there's even a special move which drops the camera into an "over the shoulder" view so you can aim a barrage of shots. Sadly, Linkle's story is fairly flimsy and there's not a lot of content here to get your teeth stuck into; she feels like an afterthought rather than a significant addition to the game's plot. 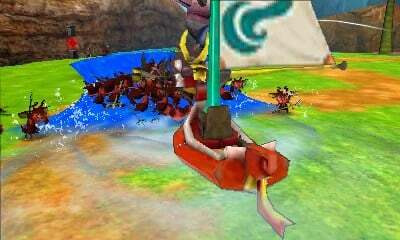 More important is an epilogue based on the world of The Wind Waker named Saga of the Great Sea, which includes new battlegrounds, enemies, sub-weapons and boss characters. 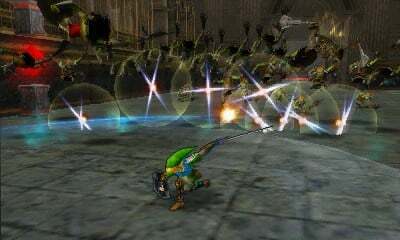 It's during these missions - which are only unlocked once all of the pre-existing Legend Mode content has been completed - that it really feels like the core Hyrule Warriors template has been built on; enemies are introduced which can only be defeated using new sub-weapons, and the concept of knocking out hostile fortifications with cannons also comes into play. Alongside the Wind Waker-inspired stages there are a selection of newcomers - Toon Link, King of Hyrule and Tetra - as well as Skull Kid from Majora's Mask. This fresh injection of talent can be seen as pure fan service for Zelda followers; they're all worth unlocking and using in battle, and a huge part of the game's long-term appeal to make sure each and every character reaches their full potential. The Wind Waker cast are especially appealing, as they - alongside the cel-shaded enemies introduced in the aforementioned epilogue - really liven up the game visually. This portable outing is an exercise in improving each character, unlocking all of their moves and boosting their rank so they are best-equipped to deal with the tougher segments of the game. To do that, you'll almost certainly want to replay Legend Mode missions on all three difficulty levels to gain experience and obtain materials essential to accessing badges, but - even more so than in the Wii U edition - the Adventure Mode becomes your key focal point in this 3DS outing. The shorter missions are arguably better suited for portable play, and the fact that it's only possible to unlock certain characters in this part of the game speaks volumes of the degree of importance that developer Omega Force places upon it. Taking place on maps which ape the look of the very first Zelda game on the NES, Adventure Mode mixes things up by offering a wide range of mission objectives, such as defeating bosses in an allotted time or facing a series of trials where you have to slay the correct enemy. Items can be used to uncover elements of each map tile, making this feel like a fleshed-out game in its own right. In terms of story, Adventure Mode certainly doesn't attempt to adhere to the proper narrative - old allegiances are cast aside as friend faces friend and foes become unlikely allies - but it's short-burst fun which will keep you busy for quite some time. To increase the allure of Adventure Mode further, a new "My Fairy" feature has been included. In this mode, you can nurture the fairies you've liberated in the main game and take them into battle as companions Each one is aligned with a certain element - just like your weapons - and picking the appropriate fairy before venturing into battle becomes a prime concern. 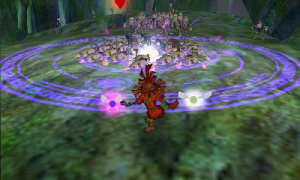 Certain keeps are guarded by elemental barriers and unless you have a fairy equipped which has the same elemental property, your character's health will slowly diminish when you enter these strongholds. In between missions you can feed your fairies to alter their statistics, dress them in various costumes and select "rental skills" which come in very useful in the middle of combat. 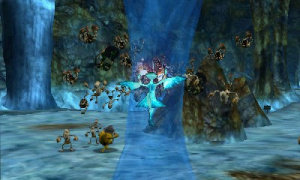 The more you use a fairy, the stronger their bond of trust becomes, making them a true asset as you tackle Adventure Mode's punishing high-rank missions. Confusingly, My Fairy mode isn't unlocked from the start - you need to smash a certain pot in a particular keep on a specific Adventure Mode tile before you gain access to it. Miss this one fairy and it doesn't matter how many others you rescue along the way - they won't be stored and the mode will remain locked, without any indication of why. When you consider that this befuddled not just two Nintendo Life staffers but another reviewer we spoke to, it's clearly not as well signposted as it should be. 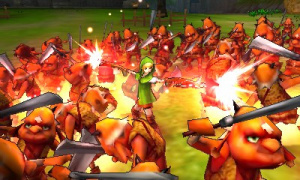 Much has been made of Hyrule Warriors Legends' use of the New Nintendo 3DS' power. Having tested the game on both the original hardware and the revised update, we can confirm that there is a considerable performance drop on the former. While it's still perfectly playable, the frame rate is quite jerky, making the New Nintendo 3DS the platform of choice if you're serious about experiencing this title at its best. Even on the more powerful system, it's worth noting that there's a noticeable frame rate drop when the 3D effect is employed; while it adds to the visuals, we found ourselves putting the 3D slider to zero to enjoy smoother performance. In almost every other regard, this is a close match to the Wii U version - all the music and sound effects have been carried across intact. For the most part, Hyrule Warriors Legends is exactly what you'd expect from a 3DS port. The visuals are downgraded and the co-op and challenge modes are absent, but otherwise this is a close match in terms of pure gameplay; it's actually surprising how well the core mechanics have been transferred over to Nintendo's handheld despite the yawning technical abyss which exists between it and the Wii U. In that respect, Hyrule Warriors Legends can be considered a success; it faithfully replicates its domestic parent on weaker - but more portable - hardware. In terms of additional content, the story is less clear. While the new characters and Wind Waker missions are excellent, they're arguably not enticing enough to tempt those who have already played the Wii U original to completion. The fact that the forthcoming DLC is being spread across both systems also means that Wii U owners shouldn't feel entirely left out if they decide against investing in both versions. However, if you're totally new to the game and don't mind rough graphics, then the 3DS edition could be considered your best bet; the Adventure Mode is ideal for portable play and the bonus content makes this feel like a more "complete" package. There are still the issues of repetition to contend with of course, but Hyrule Warriors Legends remains a solid and enjoyable spin-off from one of Nintendo's most beloved franchises. It's really annoying when you don't have the score. @Moon Would you rather us rate the game when we've not had access to all of its content, then? @Damo Don't listen to that guy. Leaving the score out until you are able to access all of the game is the correct thing to do. I want this but I have the WiiU version. I just want them to give us all the DLC for the WiiU. I just think it is a cash grab. I'm still not sure I want to return to this game yet either. I have tried. I think I have to wait another year. @justlink I'm with you. I was hoping for an "as it stands" review score but, his reasoning is sound for not doing it. I shall wait for said score... impatiently. Update: well, didn't have to wait too long apparently. A 7 huh..? I was counting on a 9 to sway me. Not a big fan of the Dynasty Warrior style of play and for me to bite, the game would have to be exceptional. As I was reading the article, I was like "sounds a 7 to me". And, lo and behold. Sorry HW. Gonna have to pass. @justlink That's what it sounds like to me as well. I never played the Wii U version and this sounds like a lot of fun. My Fairy works for me without problem thank god. But it took me forever to figure out how to get the dam Fairy 😄 I was thinking you get one when you retake one of the keeps that have the Fairy in Adventure mode. But no i found mine in a golden potin a friendly keep 😄. And they dont do much they just give you small boosts. @Damo No, I'd rather you posted the review when it's ready. I don't believe you 100% complete games before doing reviews, do you? I would've bought two copies if it meant I could play co-op again. Co-op was fun on the Wii U aside from the horrible framerate and enemy count drop. I would think having two dedicated N3DS's would fix that. How does it run on old 3ds? I don't have a New 3DS, so I probably won't get this. I read it borders unplayabilty on the O3DS, even considering it doesn't have 3D. Another review with no score!? You mean I have to read and interpret this 2,000-word monster for myself and risk forming my own opinion on the game? How am I supposed to live like this?! I'll be trading my Wii U version in for this one. I have only touched the Wii U version like twice since I got it, due to where my Wii U is located in the house. I use my 3DS more often then my Wii U because of convenience, so I'd be more tempted to play this one. The performance on standard 3DS can go sub 30 FPS, for those already owning the Wii U version and no New 3DS you are at loss. The Wii U will oly get New Characters and Weapons but no new adventure maps or story missions, the fairy is also 3DS exclusive. It's only worth it if you have a New 3DS and never played the Wii U version. They would've gotten more money out of me if they would've just put all the additional content in the Wii U version as DLC. The way they're doing it now they don't get any money from me. @abe_hikura that's my problem. The story is not coming to WiiU. If it does. I will get that. Why am I going to spend 100hrs on this again.When Bravery Second is a month away. TP is really good now and Pokken Tournament has my sites. It is all about timing. If there was nothing coming out then I would of bought it. Then there is FE Revelations to almost play and heaven help me when Dragon Quest 7 comes out. @manu0 Agreed. The Linkle and Wind Waker story mode content should be added to the Wii U version. I'm not spending $40 on the 3DS just to play that content. I am buying it but will likely leave it until I get a New N3DS. I am busy with Final Fantasy Explorers anyway. I hope to get a New N3DS XL in a month or two. I was sort of holding out for a color I like or maybe til Nintendo drops the curtain on NX. If NX does somehow include a new portable, I may skip getting a New N3DS or wait for a price drop. Can someone at least lie to me and say it makes sense to own both? i totally understand why they wait to give it a score and i actually agree with the decision. however, when im at work i usually just skim down and read the conclusion and see the score to get the gist of their thoughts. so while i get its dumb to score a game they havent fully played its still a tad annoying to see that part of the review blank. @jgibson75 You should wait until E3. That's most likely when they'll unveil the NX. I'm debating if I should get this just to transfer the character to the Wii U version... which is steep for $40. Because I ain't playing this on my old 3DS, nor do I plan to buy the New 3DS. Yet another reason to own a New 3DS. More and more reasons piling up on a fairly regular basis it seems. @Whopper744 It makes sense! I have it on the Wii U and I have beaten the story mode inly. I'll buy it again because I like being able to play it on my New 3DS. @Damo You mention it's "perfectly playable" which, not to be accusatory, sounds like it's being diplomatic. Would you personally recommend dropping $40 (or the equivalent UK price) on this if someone only has an original 3DS? There will be a Wii U exclusive DLC pack with the 3DS characters included in it released (£10.99 in the UK) so you don't need to buy the 3DS game if all you want is the new characters. If they had offered a complete seasons pass for the Wii U priced like the previous one, I would have bought it. Now they get no money from me. Review makes it sound good, I didn't know the feature where you could send an ally to another location on the battlefield, I was only aware that you could switch between characters on the fly. Had a bit of a mishaps though, just found out now that my order for the HW: Legends limited edition on the Nintendo Store had been cancelled for some unexplained reason, so I've just had to reorder it. Looking forward to the new characters when I do get it though. @Damo I was a bit surprised, yet pleased while reading this review. However, it makes sense. Why give a game to someone who is a noticible fan of the series? While they may know more, at the same time, they have a certain bias that someone who isn't wouldn't have. Your review was a refreshing read of expect from Hyrule Warriors Legends. Excellent read, good job. We will never lie to you! LOL, I'm not getting it on the 3DS, it does seem to be worth it. I'm a little surprised at the 7/10. I feel like the game should get at least an 9. The only thing the reviewer knocked was really how it's pointless to play if you've already played it on the wii u. If you consider it as a brand new game from the perspective of someone new to the game then it has a massive amount of content and I wouldn't consider that it's boring or stale. I also don't recall seeing the reviewer mention how amazing it is to play on the go. In my opinion for anybody with a n3DS this is a must buy. I haven't played the whole game and I'm super looking forward to download it as soon as I can. I found the demo really boring and I couldn't bother seeing it to completion. Way too much mindless button mashing without progression at a steady pace. I was tempted to get the Wii U version, but now I probably won't get either. I sold my Wii U copy long ago, even buying the season pass. I wasn't very good at the adventure mode and was always losing the battles because I couldn't protect my keeps enough. Too bad as I like the sound of all the new content, dlc and prefer my 3DS. I sure am glad I decided not to waste too much time playing the WiiU game. This looks like it it'll be the one to play. Gonna buy it digitally once my nintendo comes, looking forward to it! @abe_hikura I'll wait and I have the N3DS. I want that Toon Link, but my backlog is getting bad. About what I expected for the score as the game itself is very much the same despite a wealth of new content. I know I will be picking this one up for sure, the question is when? It's like THE most important thing that hyrule warrior needed more of. Wiiu's getting new characters, which is nice.. but without anything new to play with them is... meh. @Smokingspoon if by maps you mean stages, there's two new ones from wind waker, and some of the old stages have new designs based on the times of the day (for example, the water temple has a new sunset look). So super excited for this. This is going to be my relax game right before hitting the hay every night. Cant wait!! Interesting review. It's one of the few times where I read the review fully, since I've been fiercely debating whether to get the Wii U version, 3DS version, or neither. Since I love Wind Waker, I'm tempted with the 3DS version. The extra Wind Waker section looks very fun. Though I don't usually mind what the graphics are like, I might prefer the Wii U version if the 3DS is too much of a downgrade. A side by side comparison video would be very useful for me. The performance issues are a worry. I wouldn't buy this if I only had an Old 3DS. I have a New 3DS XL, but the performance drop when the 3D effect is used concerns me. I'd get frustrated quickly if I was regularly turning off 3D to increase performance. I'd need to watch a video of it running in full glorious 3D before I buy. I'll slide for now; got other games to deal with and I already have the Wii U version. 'Perfectly playable' on the original 3DS... I think you're being overly kind there Nintendolife, from footage I've seen it looks like it should have been a 'New' 3DS exclusive. I don't get the hatred towards the graphics and the pictures included in this article do the game no justice. OK, it doesn't look like the HD Wii U version, but it never was going to. But neither does it look so terrible that you can't work out what going on. I played the demo and from what I saw, it handles well, looks good for a 3DS game and the 3D effect doesn't hamper the gameplay at all on the New 3DS. I owned the Wii U version, but since I no longer own a Wii U, , I am really looking forward to the 3DS version. Honestly I loved hyrule warriors on the wii u, so i was iffy about this pick up. I'm still gonna be buying it since its gonna give new adventure maps and content more for the 3ds with the DLC, as just having characters on the wii u version is very wasteful imo when I have really have nothing truly to do with them except play in free mode and the adventure maps i've beaten, so i hope this will be a much greater challenge with these new maps. I don't want to play a game on my 3ds that has 'rough graphics'. So that's me out. Reading the reviews it seems that the reviewer was struggling to justify why this game was worth buying for all its shortcomings and average score. The best 3ds games are those that are designed for the 3ds and not Wii U games that have been downsized to fit. I'm not sure if this is another Nintendo game in the cost cutting of new releases excerise. Which includes Wii games given a makeover. @Knuckles Thanks - I certainly didn't hate the Wii U version, I just found it a bit repetitive after a while. This is an issue with pretty much every Warriors / Musou title, to be honest. @Damo I was just used to hearing near universal praise for Hyrule Warriors that I needed the reminder that no game is perfect, and that not everyone likes the same things. It is really a niche audience, the Warriors games. Thanks for the reminder that I may get bored while playing this. Considering how I have not played the Wii U version, I am excited for this! @DoctorOverbuild Honestly, it is hard to say. Yes, the Wii U gets most of the new content that the 3DS will get, but I find it hard to rule out that the NX may get a port with all content for just 60-70 dollars. I'm getting the 3DS version regardless. @Damo Hey do you think you could do a small take on the newly added WiiU version content as well. To see if its worth puting any extra money and time into it. Im not expecting a full review eince you done one on the game already. but I just want to hear your oppinion on it. Got mine preordered with the art book. I played the Wii U one until I could play no more. I'm not sure why I did. I guess HW on the go seems like a good idea. I just wished there was cross save. All that leveling up and weapon brewing. And... really? Still no online multiplayer. Aside. I'll play it, and it'll probably be pretty good. This is very important, so I hope you read this and pass this info along to the important people. The last couple of days have seen plenty of rumors about a playstation 4.5 and an upgrade-able xbone. many of the worries about consoles following a smartphone business model centers around the console base being split over those who have the original vanilla model, or the new, improved model, and if this means vanilla owners will end up with noticeably inferior games. Well, we don't have to guess what that would look like, we have the New 3ds as a good example. I think if the console base is split like this, game reviewers owe it to gamers to let them know exactly what kind of a situation we're getting into (journalistic integrity and all that). Already pre-loaded. Will be my first big 3DS title this year. I played the demo and was shocked by the graphics. Sure it was to be expected, but the gap between the Wii u and 3DS version is quite big! It does do the job, but I of course prefer the Wii u graphics. Yeah, skipping out on this. I love the Wii U version, but I don't own a New 3DS. I will be getting all that new DLC though. I love that their still giving the Wii U game support after almost two years. @River3636 Never understand how anything you do not have to buy is a cash grab? The 3DS has a massive user base (especially compared to the WiiU) so why not let them play it too? @Henmii I think the "functional" graphics work - but only because the game pace is high. @mav-i-am - I am not sure what you mean. Considering my previous purchase of the HW WiiU game. I know the 3DS has more users, but when you release a game and call it the definitive version a year later. Then, put something in it that should be a DLC for the home console base. It certainly does look like a cash grab. I like this game. I even have a N3DS and would like to play HW on it in the future, but why would I. Timing is another thing. Look how many games are coming out. Please and spare me the details. If you own the WiiU version you should not get this game. Unless you absolutely love it and are a completest. I had a great time playing it but I will not go back to it now. It is to soon for a release on this. @ people replying to comment #1, it's the MOON, of course it will say something like that! There's the double standard from Nintendo again. SNES games are too slow for Old 3DS so it wasn't supported. This Hyrule Warrior is too slow for OLD 3DS but still supported? Maybe profits from SNES games are too low for them to care, but this game is a a cash grab. IGN's Jose Otero more astutely pointed out this game's astonishing number of failings. Complete garbage; deserves its own landfill. Picked up a physical copy of this today and was surprised to find eshop codes in the case for not only the Wii U edition DLC, but also the 3DS Hyrule Warriors Legends theme. Nice. @Nico07 Odd. I don't have this in my game box. Mine does not have the 3DS Theme download. I ordered from Amazon.co.uk. @alasdair91 Im sorry to hear that, especially since you had to search for the insert. Mine is the North American version, so it must be a regional offer, too bad. Got the wiiu characters from a friend so I think I'm going to pass on this one. My 3ds backlog is too large to replay a game I already own. @thehoppypoppy Woah, that would be awesome, they could easily add all the different classes as playable characters. I'm so in! I recently bought the Etrian Dungeon game, only because it was Etrian, sadly it wasn't all that good, probably same reason i never got into the Pokemon Dungeon games, meanwhile i loved Shiren the Wanderer, and Izuna, i think the party system ruins the genre for me, and prefer it if im alone on the game. @Whopper744 I'm trying to do the same. The WiiU version, as with most of my WiiU games, remains a good option to play when there's a friend over, but all of my actual playtime is going to the 3DS now.